In 2012, after a huge fundraising campaign, the British Library acquired the St Cuthbert Gospel, formerly known as the Stonyhurst Gospel, the oldest complete European book to survive intact in its original binding. British Library MS Additional 89000, fol. 1r. 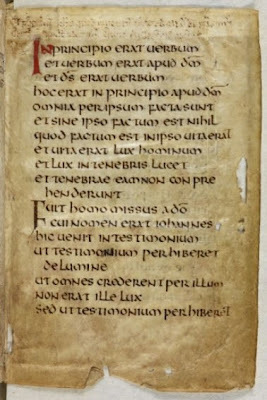 The St Cuthbert Gospel. Image: British Library. To celebrate the acquisition, an exhibit was mounted; the book (now officially British Library MS Additional 89000) continues to be on display and a complete digital facsimile was created and made publicly accessible on the British Library website. Thus anyone who wishes to can now read this seventh-century book. But will anyone access the book, in person or through the digital facsimile, in order to read it? The book contains the Latin (Vulgate) translation of the gospel of John, and there is (as far as I know) nothing at all original or unexpected about the text it presents. Surely most of the people who may have viewed the book on display at the British Library, or who look at the facsimile as one of the ‘highlights’ of the BL’s digitised manuscripts, don’t read Latin; and if they do, they are surely not reading the gospel of John to find out what happens next. Most of the time, I suspect, we are not interested in reading the St Cuthbert Gospel, but in viewing it. The St Cuthbert Gospel was used, valued, and preserved, but not in order to be read. As a matter of fact, it is very likely that the St Cuthbert Gospel has been very seldom read throughout the thirteen centuries since it was made. This book is so well preserved because in AD 698 it was put in a coffin with the body of Cuthbert, the former bishop of the monastic community of Lindisfarne, in the north of England. After Viking raids threatened the monastery, the monks relocated inland, taking Cuthbert’s coffin with them, and eventually settled in Durham. There, in 1104, the coffin was re-opened and the book inside was found. During the twelfth century it appears to have been venerated as a relic of the now-sainted Cuthbert; it was taken out of the coffin and kept in a small leather bag. Reginald of Durham, in a twelfth-century account of the miracles performed by the saint, says that anyone who wished to touch the book was required to fast beforehand and put on a special garment; a monk who failed to wash his hands before touching it, Reginald writes, was taken ill. Important visitors were sometimes allowed, as a special honour, to wear the book in its little bag around their necks. It is clear that for most of its medieval history, as well as for most of its modern history, the St Cuthbert Gospel was used, valued, and preserved, but not in order to be read. We tend to assume that the primary (perhaps even the only) purpose of a book is to be read: that is, to extract textual information from it. But the history of the St Cuthbert Gospel reminds us that many other uses for books are possible, and that some of them (such as religious veneration) might even prevent or discourage reading. Book historians who study the practices of reading in the Middle Ages have noted that, in early medieval monastic communities, book production and reading were primarily exercises in religious meditation; the acts of copying the sacred text, and of murmuring it aloud, had intrinsic spiritual value. It was not until later in the Middle Ages that text documents such as books came to be valued more for their informative and communicative functions. Even today, there are many more things one can do with a book than read it. For the distinction between reading and viewing, I am indebted to Siân Echard, Printing the Middle Ages (Philadelphia: U of Pennsylvania P, 2008). Information about the history of St Cuthbert and his relics can be found in David Rollason and R. B. Dobson, ‘Cuthbert [St Cuthbert] (c.635–687),’ Oxford Dictionary of National Biography (Oxford University Press, 2004); British Library, ‘Add MS 89000’; and Gerald Bonner, David Rollason, and Clare Stancliffe, eds., St Cuthbert, His Cult and His Community to AD 1200 (Woodbridge: Boydell P, 1989). The information from Reginald of Durham is taken from Victoria Tudor, ‘The Cult of St Cuthbert in the Twelfth Century,’ in Bonner, Rollason, and Stancliffe, at 460. On changes in reading practices during the Middle Ages, see the introduction to Guglielmo Cavallo and Roger Chartier, eds., A History of Reading in the West, trans. Lydia G. Cochrane (Amherst: U of Massachusetts P, 1999).